"SLIDESHOW: Week-in-Review, May 30, 2008"
View a slideshow with a capsule summary of this week's top stories, which include how nanotubes may be as bad as asbestos, how computers are modeling the mechanism by which nanoparticles harm living cells, how high-temperature superconductors could pave the way for supermagnets and how analog design expertise is rare and valuable. You'll also see a capsule review of this week's MEMS Ahead blog and a sneak preview of this weekend's Bourne report. 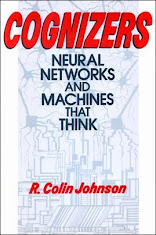 "PODCAST: Week-in-Review, May 30, 2008"
Welcome to Week-in-Review by R. Colin Johnson. Here I review the week's tops stories as compiled from interviews I do for EETimes--where you'll find global news for the creators of technology at EETimes.com. This week's top stories include how nanotubes may be as bad as asbestos, how computers are modeling the mechanism by which nanoparticles harm living cells, how high-temperature superconductors could pave the way for supermagnets and how analog design expertise is rare and valuable. You'll also see a capsule review of this week's MEMS Ahead blog and a sneak preview of this weekend's Bourne report. "MATERIALS: High-temp superconductors pave way for 'supermagnets'"
The world's highest temperature superconductors share an unusual affinity for magnetism, according to researchers in the U.S. Earlier this month, high-temperature superconducting iron-compounds with lanthanum and arsenic were separately discovered by Japanese and Chinese researchers. Now, U.S. researchers have confirmed those results, heralding a new generation of "supermagnets" for magnetic-resonance imaging (MRI) machines, superconducting electric motors, power-generators and -transmission lines. "NANOTECH: Computer models how nanoparticles harm cells"
Until now, the mechanism that causes living cells to malfunction in the presence of buckyballs has been misunderstood, according to the creators of perhaps the world's most accurate computer model for living-cell membranes. These scientists now claim to have attained an understanding of the probable mechanism for how buckyballs can invade cells and cause a wide variety of damage. For half a decade, scientists have warned that nanoparticles have a strong affinity for animal DNA, attaching to it in a manner that prevents immune responses and even self-repair of cells. Experimental evidence has confirmed that buckyballs in our rivers can clog the gills of fish and damage their brains; that nanoparticles in groundwater can stunt the growth of plant roots; and, just last week, that inhaling nanotubes can result in the same kind of maladies that are caused by asbestos. Despite mounting evidence of toxicity for almost every shape and size nanoparticle--from long-thin nanotubes to spherical buckyballs--nanoparticles are nevertheless being mass produced for a variety of applications, from transparent sunscreen that is opaque in the ultraviolet to performance-enhancing dopants for solar cells. "CHIPS: Analog design expertise is rare, valuable"
An enduring shortage of analog engineers--that may be getting worse rather than better--is requiring even digital chip powerhouses like Freescale Semiconductor Inc. (Austin, Texas) to redouble their efforts to recruit and groom analog engineers in the "black art" of mixed-signal processing. "NANOTECH: Nanotubes may be as bad as asbestos"
Carbon nanotubes could cause the same maladies as asbestos, according to a study by University of Edinburgh, which also showed that long-thin fibers cause the pathological response known to be a precursor to mesothelioma cancer in mice. 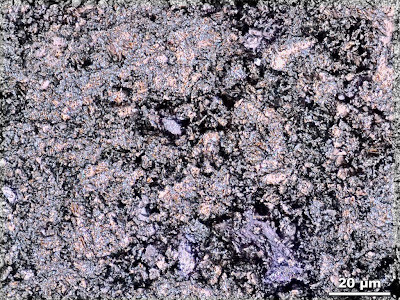 Both carbon nanotubes and asbestos fibers were injected into the abdominal cavity of mice, a technique that is accepted in medical circles as a predictor of how pathogens affect lung tissue. The results showed that like asbestos, long nanotube fibers were thin enough to penetrate deep into lungs, but their length prevented the lungs' built-in mechanisms from removing the particles. Carbon nanotubes have high aspect ratios, only nanometers in diameter but sometimes microns long. Aspect ratios are often over 1000:1. In semiconductors, nanotubes are usually safely affixed to a substrate, but their use in other industries could enable them to enter the water or air where they could become a health hazard. If nanoparticles are breathed into the lungs, the researchers warned that the health affects would be as severe as breathing in asbestos. Asbestos exposure can cause lung cancer in 30 to 40 years after initial exposure. "SLIDESHOW: Week-in-Review, May 23, 2008"
View a slideshow with capsule summaries of this week's top technology stories including how a room-temperature terahertz laser was invented, how nanotechnology is making radioactive sensors obsolete, how a beetle solved the photonic-crystal mystery that has been bugging researchers, and how Freescale and STMicro are sampling their first jointly developed automotive microcontroller, which is "green" for the Chinese market. Plus get a summary of this week's MEMS Ahead blog. "PODCAST: Week-in-Review, May 23, 2008"
This week's top technology stories including how a room-temperature terahertz laser was invented, how nanotechnology is making radioactive sensors obsolete, how a beetle solved the photonic-crystal mystery that has been bugging researchers, and how Freescale and STMicro are sampling their first jointly developed automotive microcontroller, which is "green" for the Chinese market. Plus get a capsule review of this week's MEMS Ahead blog. "OPTICS: Beetle solves photonic-crystal mystery that's bugged researchers"
Semiconductor makers should take a hint from Mother Nature when pursuing photonic crystals for optical computing, according to University of Utah researchers studying the Brazilian beetle: this bug's eerie iridescence is evidence of its unique photonic lattice structure--called the "champion" architecture in photonic circles. Diamonds have it, but they cannot act as photonic crystals because their atoms are packed too tightly together. 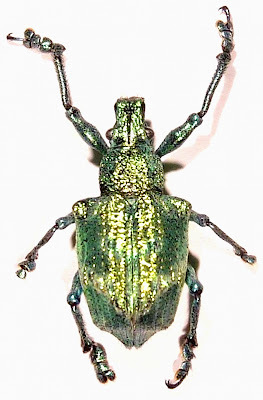 By replacing the diamond's carbon atoms with cylindrically shaped molecules spaced to match a single wavelength of light, the beetle's scales could hold the key to solving long-standing problems with fabricating three-dimensional diffraction gratings within photonic crystals. "OPTICS: Room-temperature terahertz laser invented"
What's claimed to be the world's first room-temperature terahertz laser harnesses the optical equivalent of heterodyning to bridge the terahertz gap. Today, a terahertz-gap exists where most semiconductor lasers fail to operate--between microwave wavelengths (centimeters) and optical wavelengths (microns). In between are the millimeter wavelengths--terahertz frequencies (1-10 THz). The only semiconductor lasers that run at terahertz frequencies today are supercooled quantum cascade lasers (QCL). Now, the co-inventor of the QCL has demonstrated a heterodyning method cast in nonlinear materials that mixes two easy-to-generate optical frequencies spaced apart at the desired terahertz frequency, resulting in a room-temperature terahertz laser. Terahertz lasers enable scanning like x-rays, but are completely safe to use around people. Using a terahertz scanner, airports could detect hidden weapons under clothing, as well as hazardous and toxic materials inside luggage. Terahertz lasers could also remotely detect hazardous gases floating in the air, offering a potential solution to identifying improvised explosive devices from a distance. "NANOTECH: makes radioactive sensors obsolete"
"Green" smoke-alarm ionizers using field-emission from nanotubes instead of radioactive isotopes could eliminate a source of dirty-bomb material, according to Applied Nanotech Inc. (Austin, Texas) and Sionex Corp. (Bedford, Mass.) which have funding from Homeland Security to produce a small, safe, high-performance sensor using electron field emission from carbon nanotube arrays instead the ionizing alpha rays from radioactive isotopes. Many American households have as much as a milligram of radioactive americium-241 in the various smoke alarms and other gas-phase detectors found there. About a fifth of a gram of americium is used to ionize the air inside a smoke detector. But just one gram of americium is dangerous for people to handle; dekagrams to hectograms are enough for "dirty" bombs, and kilograms could be used to make a nuclear bomb. 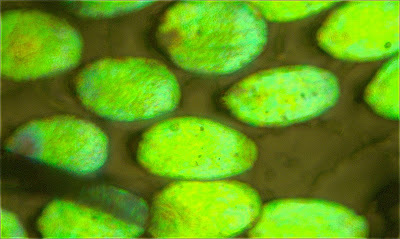 Instead of seeding our land-fills with radioactive materials like nickel-63 and americium-241, which have half-lives of 100 and 432 years, respectively, the Applied Nanotech and Sionix joint-development effort aims to provide a safe, inexpensive, high-performance alternative method of ionizing samples by using carbon nanotube emitters integrated into air-flow passages ahead of a differential mobility spectrometer. Applied Nanotech and Sionex claim to have proven in principle that carbon nanotube emitters can perform all the necessary ionization and identification steps without the use of radioactive materials. "CHIPS: Freescale/ST sampling first jointly developed automotive microcontroller"
China will pass the United States as the world's top automotive market in five to 10 years—circa 2015, according to McGraw-Hill analysts at J.D. Power and Associates (Westlake Village, Calif.) Freescale Inc. (Austin, Texas) and STMicroelectronics NV (ST; Paris) plan to be serving that market, starting with their first jointly developed automotive microcontroller, which they announced today at the China International Automotive Electronics Products & Technologies Show (Shanghai). The jointly developed 32-bit engine microcontroller includes special on-chip hardware for managing greenhouse emissions, for easy implementation of electronic "paddle-flap" manual-shift transmissions, and for running in very fuel-efficient modes near, but not knocking. Freescale recently opened a joint development effort with Chery Automobile Co. Ltd., the largest automobile maker in China, to modernize its vehicles with electronic controllers and to give Freescale a foot in the door of the Chinese automotive supplier market. "PODCAST: Week-in-Review, May 16, 2008"
"OPTICS: HP targets silicon photonics"
Using silicon photonics to connect blades, boards, chips and eventually cores on the same chip has become a strategic goal for Hewlett Packard Co. Technology efforts were described in HP Labs' first annual Photonic Interconnect Forum. By harnessing its expertise in nanoimprint lithography to fashion low-cost, high-speed silicon photonic devices, HP said it hopes to seed the fledgling community of optical interconnect component makers. Rather than doing it all, HP is seeking partners with other silicon photonic pioneers in hopes of developing its first optical interconnect technology in products by 2009. HP described its laboratory demonstrations of the components needed for creating optical interconnects that handle communication among systems and boards, including two versions of an optical interconnect--a free-space bus (that beams light through air) and a photonic-fiber bus. Its free-space optical connection provided a 240 Gbit/s optical connection that beamed information through the air between boards. 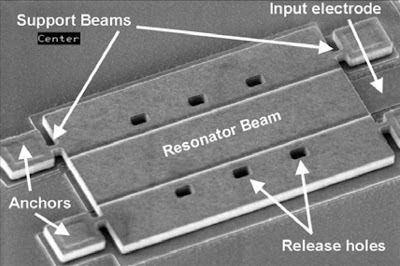 Researcher also described a MEMS micro-lens scanner fabricated from silicon-on-insulator that focuses between-board lasers. 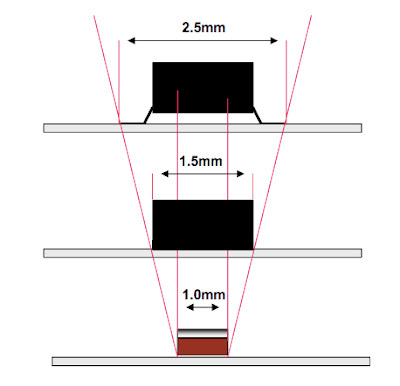 HP Labs also showed how its optical bus could haressed nanoimprint lithography to fashion cheap plastic waveguides, micro-lenses and beamsplitters. 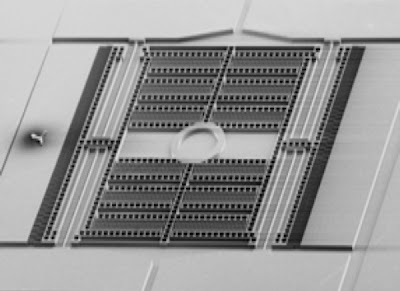 Its first demonstration was of a 10-bit-wide optical data bus that used just 1 milliwatt of laser power to interconnect eight different modules at 10 Gbit/s/channel for an aggregate bandwidth of over 250 Gbit/s. 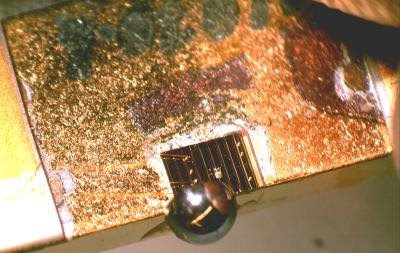 Most photonic interconnects use vertical cavity surface-emitting lasers (VCSELs), but HP Labs also showed inexpensive methods of eliminating the need for expensive gallium arsenide chips, using plasmonic LEDs that could cut costs, and a silicon ring resonator that it hopes to fashion with imprint lighography. "WIRELESS: Testbed streamlines RFID development"
RFID tags flooding warehouses and product shelves tax current testing methods, which separately tune into each tag. To streamline testing while enabling rapid prototyping of new designs, Georgia Institute of Technology engineers have crafted a new test bed they say is capable of simultaneously testing hundreds of RFID tags while emulating the chip in a new tag design. RFID tags are used for everything from inventory management to toll collection to passport identification to tracking luggage. Most tags are passive, including a chip and an antenna that absorbs a radio signal to backscatter its identity to a nearby reader. The biggest problem with testing RFID tags is the sheer volume--warehouses and store shelves often contain hundreds of tags within range of a reader, many hidden behind other tags. When multiple tags are within range of a reader, the usual protocol is to interrogate the tag with the strongest signal, then put it to sleep and proceed on to the next strongest signal. That serial process can be time consuming. Instead, the Georgia Tech test bed uses an anti-collision system capable of transmitting multiple, unique signals. The system allows up to 256 tags to be interrogated simultaneously. Instead of requiring readers to be within about a foot of tags, the Georgia Tech test bed can communicate with RFID tags within 400 square feet of the tester. Along with collecting tag information, the system can also track their signal strength in real time. "MEMS: DriveCam indentifies risky driving"
The most successful driver-assistance systems today are not real-time, like the EyeQ system-on-chip (SoC) from STMicroelectronics and Mobileye, but, instead, offer reports on dangerous driving incidents the next day. 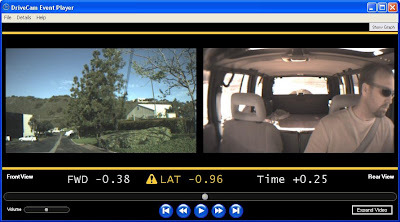 By using pattern recognition to detect risky driving and on human experts to give advice on how to improve each individual's driving safety record, companies like DriveCam Inc. (San Diego, Calif.) are lowering costs for fleet owners and bringing peace of mind to parents worried about reckless driving by their teenagers. DriveCam monitors its in-vehicle cameras 24/7 for $75 per month, for which you get recordings of all risky events plus written evaluations and concrete advice for improving driver safety. 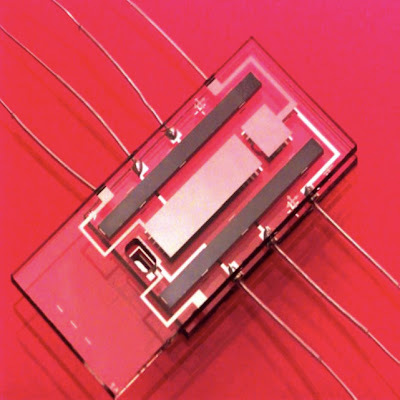 "CHIPS: Avago claims first RF chip-scale packaging solution"
The world's smallest radio frequency (RF) integrated circuit packaging solution has been claimed by Avago Technologies Ltd. (San Jose, Calif.)--a spin-off of Agilent Technologies (which was a spin-off of Hewlett Packard). Avago claims its WaferCap is the industry's first wafer-level chip-scale packaging (CSP) technology, squeezing RF chips into a 1-by-.5-by.25 millimeter leadless "0402"-size package, more familiar as the form factor for surface-mount technology (SMT) capacitors. 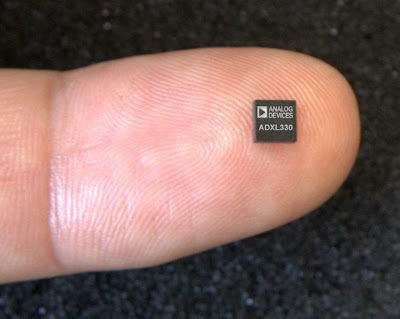 The first in Avago's growing family of 0402-packaged chips is the world's smallest RF amplifier, available in five frequencies ranging from 500 MHz to 12 GHz, but the company claims its packaging can go as high as 100 GHz. Other RF devices on Avago's list of candidates for the tiny 0402 package include analog and digital attenuators, broadband detectors, bypass- and high-gain amplifiers, octave-band detectors, gain blocks and RF switches. "PODCAST: Week-in-Review, May 9, 2008"
Welcome to Week-in-Review where we cover the week's top technology stories. This week my top stories include how a Raytheon Exoskeleton is bringing 'Iron Man' to life, how the major leagues drafted electronics for a performance-boosting mouthpiece, how a MEMS vibration sensor debuted and how the first MEMS oscillator has been listed in the Digi-Key catalog. "ALGORITHMS: Major leagues draft electronics for performance-boosting mouthpiece"
Athletes can achieve their optimal performance by submitting to a dental procedure that combines electronic stimulation, measurement and analysis to create a custom "pure power mouthpiece" (PPM), according to its orthdondist inventor and others certified to perform the technique. As unlikely as it sounds, major league athletes such as the Boston Red Sox's Manny Ramirez are wearing the PPM to improve performance, sans drugs. An ultralow-frequency transcutaneous electrical nerve stimulator (TENS) relaxes the muscles into their optimal resting length. A second electronic device, called a computerized mandibular scanner (CMS), performs a real-time, continuous three-dimensional scan of the muscles of the face and jaw. 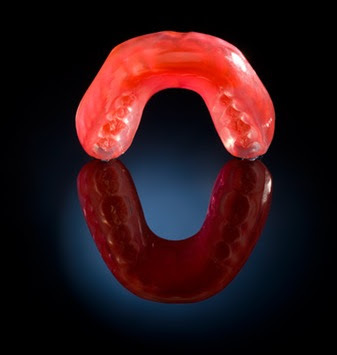 When the optimal occlusal position is achieved, the mandibular scanner records that position and fashions a mouthpiece that instantly puts the jaw in its optimally relaxed position. The world's first micro-electro-mechanical system (MEMS) accelerometer technology capable of tracking vibrations in industrial equipment at frequencies as high as 22-kilohertz (kHz) debuts today at the Sensors + Test Conference (May 6-8, 2008, Nuremberg, Germany). Created by Analog Devices Inc. (Waltham, Mass. 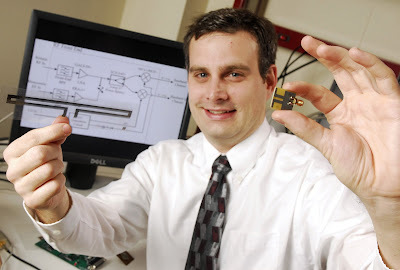 ), the MEMS technology uses unique differential accelerometers--two side-by-side MEMS mechanisms capable of cancelling out common mode noise. ADI's vibration and shock sensors are also small enough that equipment designers can build vibration=detection chips into industrial process-control devices, rather than as add-on modules. Today, vibration sensors are piezo-electric-based modules that are limited to about 5-kHz frequencies and cannot be mass produced the way ADI uses CMOS processing lines to mass produce its accelerometers. As a result, according to ADI, it can undercut the price of piezo-electrics by 50 percent--$35 as opposed to $70. "MEMS: First RF MEMS listed in distributor catalog"
The first microelectromechanical system (MEMS) oscillator to be listed in the world's biggest catalog distributor, Digi-Key Corp. (Thief River Falls, Minn.), comes from Discera through its original equipment manufacturer partner, Abracon Corp. (Rancho Santa Margarita, Calif.) Discera's MEMS oscillators will be priced below the equivalent quartz crystal oscillator, placing MEMS squarely into mainstream electronics, according to MEMS analyst Marlene Bourne of Bourne Research (Scottsdale, Ariz.). Bourne said that the low price of Dicsera's Abracon-branded RF MEMS oscillator, running at from 1-125 MHz, means that Discera will have to ship in high volumes to make a profit. "ROBOTICS: Raytheon Exoskeleton brings 'Iron Man' to life"
The much-ballyhooed movie, "Iron Man," opens in theaters worldwide today (May 2), but the real "iron man" is already under construction at Raytheon Company (Salt Lake City, Utah). Raytheon's Exoskeleton project is the brainchild of project leader Stephen Jacobsen and is being funded by the U.S. Army. The project, according to the company, permits soldiers to don an Exoskeleton suit that amplifies their strength--enabling them to lift 200-pound payloads without tiring. 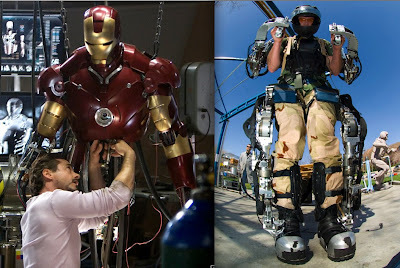 The "Iron Man" exoskeleton being worked on by Robert Downey Jr. in the movie (left) is eerily similar to the real Exoskeleton (right) being developed at Raytheon. In addition to amplifying strength and endurance, Raytheon also claims its Exoskeleton can increase a soldier's agility--enabling feats similar to those demonstrated--courtesy CGI (computer-generated imagery)--by the "Iron Man" in the film. Raytheon's Sarcos team, which has been developing the Exoskeleton since 2000, has demonstrated its wearer performing feats of strength as well as agility, including kicking a soccer ball, working out on a punching bag, climbing up stairs and navigating rough terrain. As the ultimate mechatronics realization, sensors follow the soldiers own movements, which microcontrollers then transfer to the actuators in the Exoskeleton. Jacobsen's stated goal is to create an Exoskeleton suit that enables humans to "work inside robots" instead of just alongside them. "PODCAST: Week-in-Review, May 2, 2008"
Welcome to Week-in-Review where we cover the week's top technology stories. This week my top stories include how the 'missing link' memristor completes circuit theory and could enable 100-Gbit memory chips, how self-healing mesh optical nets emerged, how 'what if' software can now simulate wireless nets and how the second-generation 'Robot Guitar' was built, plus a sneek preview of this weekend's Bourne Report Radio Show.